How to connect a camcorder or audio recorder to your airplane’s intercom ? 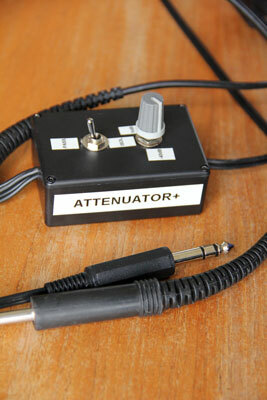 You need an Attenuator+ ! Over the course of my flying I captured quite some video with handheld camcorders, audio recorders or smartphones (like iPhone). I found out that next to good video, capturing the audio from an airplane intercom and ATC chatter in a crisp way adds much to the value of your flying videos. Also, it makes sense to just record your voice to judge your ATC-talking progress when in training. However, when you try to capture audio from the built-in microphone and the airplane speaker, the only audio you really capture is engine noise. And when you try to connect the intercom audio directly into a microphone input of a camcorderor iPhone, your audio is distorted, and you are pumping DC voltage back into the intercom system. Also I didn’t want to fiddle with sticking microphone inside my headset. I tested my Attenuator+ in a typical GA aircraft and it works very well. Below you can hear a piece of the test that I performed and recorded with my camcorder. When the controller in Kortrijk reads the new clearance of the arriving twin so he can continue IFR to Merville, I turn down the attenuation (at around "squawk 6070"). You can hear the mike input on the camcorder saturate and the audio deforms. Later in this recording I crank up the attenuation again and the deformation disappears. That proves the working of the attenuator: the saturation and deformation disappear when the attenuation is set. 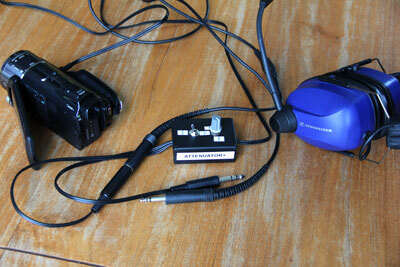 => Here is the Attenuator+ Test Audio (MP3). The Attenuator+ allows me to connect microphone input of my camcorder or iPhone to the airplane intercom without loosing an intercom port (there is a loop-through). It also blocks DC voltage from the camcorder entering the intercom electronics. And when I want to disconnect the audio real quick, I flick the isolation-switch, so I am sure that the camcorder or smartphone is out of the loop. The result is a crispy clear intercom and ATC voice recording into the camcorder with the video: no engine noise, only crispy clear voices. I designed and made this Attenuator+ for myself, but when I described it on this website and on internetfora, people asked me to make attentuators for them. So I started producing batches of handmade attenuators, sell them and ship them around the world. 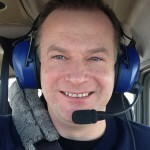 Check out the Attenuator+ in use during training flights by my customer Chris: http://vimeo.com/18917000 and http://vimeo.com/19430838. The way it works is: you plug the large male Attenuator+ jack into a female headphone output of the intercom system, and your large male headphone jack plugs into an extra female connector into the Attenuator+. It’s a basic mono loop-through of the audio, so your headset keeps its normal function. A long output cable from the Attenuator+ then plugs directly into the small female jack microphone input of your camcorder / audio recorder / smartphone. You can set the attenuation with a turning knob. The whole system can be isolated from your intercom with the flip of a switch for safety reasons (yes, this is a good design 😉 !). It’s best to test and set this before the flight by means of checking how the audio comes through and get recorded on your recording device. It works with my old SD and new HD Sony camcorder, and it should work with any recording device which has a small female microphone input jack, including smartphones. In the meanwhile I have already delivered Attenuators+ to Florida (US), Belgium and Holland … and the users are happily capturing in-flight intercom and ATC… in full safety and without the engine noise or distortion. I recently produced a batch again, so if you are interested to record your own in-flight ATC and intercom audio with my Attenuator+, just let me know and send me an email ! I typically send prospective buyers a copy of the manual so you can verify that this works. Then I give you the price and the shipping (typically by registered mail from Belgium, Europe) and payment information (Paypal works well). If it doesn’t work to your satisfaction, send it back and I’ll refund the payment. The Attenuator+ is an amateur hobby project. I tested and verified its working during multiple flights, but it has not been officially tested, validated or approved by any certifying authority. This is not required for intercom systems in general aviation flights. But it works like a charm and you can boast your ATC talking skills recorded on video ! I wonder if your attenuator would work for the 60 hz problem I am encountering with my go pro cable/headset system. My system has a Y adapter that allows me to plug in my headset, but it also has a line with a USB end that I can plug into the 110v outlet in my Eclipse jet to continuously charge my go pro. When I unplug the power line, there is no hum. When I plug in the power line I get a hum like what you can hear on this Vimeo video https://vimeo.com/home/myvideos. Your thoughts? It appears that your AC generator of your jet is creating the hum that your GoPro is picking up. Most probably that hum is enetering via teh USB powering line, and not via the audio line. So I assume that if you want to filter out the 60Hz from the DC on the USB line. My Attenuator+ won’t help in that respect. I guess you will have to look for a lowpass filter on your USB line.